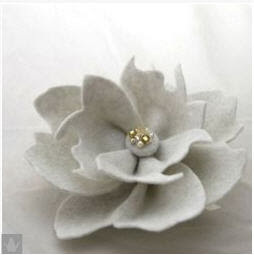 I was helping my boyfriend shop for his mother's birthday, and I thought a floral brooch would make a lovely gift. I was looking for something very specific - classic but not old fashioned, simple but not plain, feminine but not frilly. It's been a long time since I shopped for something like this at the mall, and I was supremely disappointed by the schockly, cheezy accessories and jewelry they carried. (note to retailers - give us a compelling reason to spend by stocking your shelves with beautiful things, and we will gladly part with our hard earned money!). 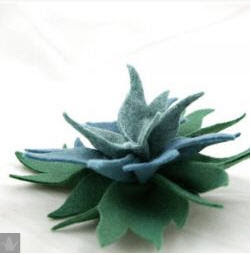 I had a suspicion I could find something handmade, beautiful and affordable online. That's when I found these gorgeous floral broochonniere by Kireina. 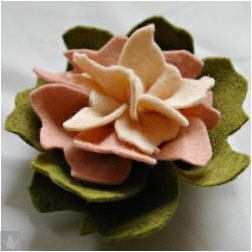 Her broochonnieres are hand made using the finest merino wool and blended felts. They come in a variety of colors and styles. You can also request that an alligator clip be attached instead of a pin if you prefer to wear it in your hair. Unfortunately, I found these after my boyfriend decided to buy pearl earrings (yawn). But now I know what I'll be sending for Mother's Day.